The field of bioanalysis has advanced rapidly, propelled by new approaches for developing bioanalytical methods, new liquid chromatographic (LC) techniques, and new mass spectrometric (MS) instruments. Moreover, there are a host of guidelines and regulations designed to ensure the quality of bioanalytical results. Presenting the best practices, experimental protocols, and the latest understanding of regulations, this book offers a comprehensive review of LC-MS bioanalysis of small molecules and macromolecules. It not only addresses the needs of bioanalytical scientists working on routine projects, but also explores advanced and emerging technologies such as high-resolution mass spectrometry and dried blood spot microsampling. 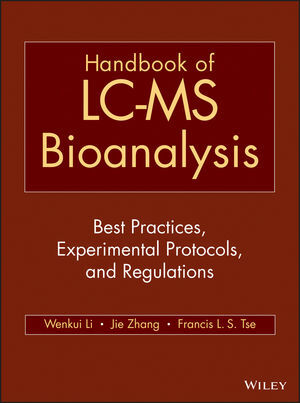 With its focus on current bioanalytical practice, Handbook of LC-MS Bioanalysis enables bioanalytical scientists to develop and validate robust LC-MS assay methods, all in compliance with current regulations and standards. WENKUI LI, PhD, is Senior Fellow in the Department of Drug Metabolism & Pharmacokinetics at Novartis Institutes for BioMedical Research, where he focuses on regulated LC-MS/MS bioanalysis for the toxicokinetic and pharmacokinetic assessment of drug candidates. Dr. Li is a member of the editorial board of Biomedical Chromatography. JIE ZHANG, PhD, is Senior Fellow in the Department of Drug Metabolism & Pharmacokinetics at Novartis Institutes for BioMedical Research, where he focuses on regulated LC-MS bioanalysis for the toxicokinetic and pharmacokinetic assessment of drug candidates. In addition, Dr. Zhang evaluates and implements novel technologies and processes in regulated LC-MS bioanalysis. FRANCIS L. S. TSE, PhD, is Vice President of Drug Metabolism & Bioanalytics at Novartis Institutes for BioMedical Research, overseeing the unit's strategy and operations in North America and Asia. Dr. Tse is a Fellow of the American Association of Pharmaceutical Scientists, APhA Academy of Pharmaceutical Research and Science, and American College of Clinical Pharmacology.